Everyone do unboxing videos these days, although unboxing isn’t a new concept in any way, T-Mobile decided to do it to highlight the return of water resistance using the Galaxy S7. It certainly makes the users want to take a look at it. This gets the future S7 owners excited. Imagine bringing your smartphone to the pool without needing to lock it ahead and snapping several pictures underwater? Samsung eventually finally Galaxy S7 edge and the Galaxy S7 on Sunday at Mobile World Congress 2016, after months of expectations. 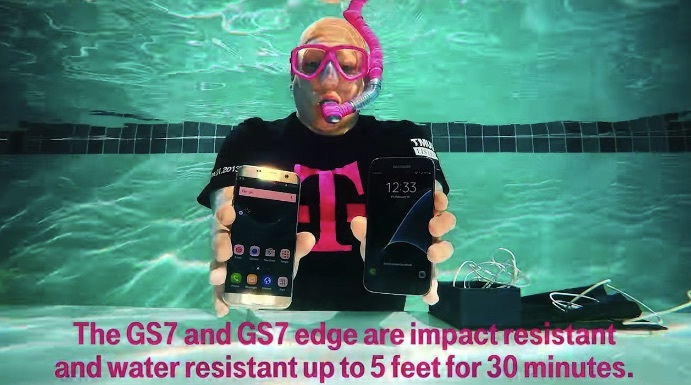 T-Mobile shot at a whole unboxing video underwater. Much more than a really smart advertising stunt, the video makes it clear the S7 edge and S7 function underwater. Whether it is shooting images, streaming video or a video call, it is possible to do it submerged. This was done to show off the durability of the Galaxy S7. The mobiles are similar to their 2015 predecessors as expected, however, you can find several substantial improvements worth noting. Both Galaxy S7 and S7 edge are waterproof for up to 30 minutes of submersion and they have larger batteries and cameras comparing to the predecessors. In the video, Des Smith, Senior Product Manager at T-Mobile rip open the mobile’s packaging, and it is pretty much everything you’d expect from a video of a man opening a carton in a pool. He then eventually pulls the handset out without leaving the water. It’s an enjoyable ploy yet, although you will not be surprised in the event you’re already familiar to the implications of an IP68 rating. Here at TechnoDoze I write latest news on Artificial Intelligence, Virtual Reality, Smart Gadgets, Smartphones and everything related to technology.